When you are the first line of defense during a CBRN incident or hazmat accident, the Andax PPE Gear Pac, CBRN Gear Pac, CBRN Kit or any of Andax's spill pacs is the right tool for the job. 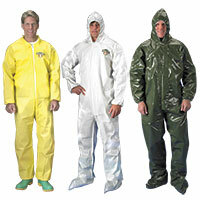 It is used by police, fire, rescue and hazmat teams as a quick reaction and protection kit. Seconds make the difference between life and death, so the first at the scene must be equipped to begin saving lives and making a difference immediately. 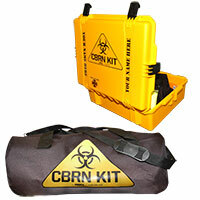 First responders need their CBRN equipment ready for action. These Kits and Pacs are self-contained and ready to use. Andax has CBRN equipment! CBRN Overboots provide more than 24-hour protection against chemical and biological warfare agents. 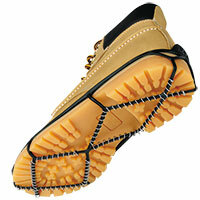 Their smooth surface, special rubber compound and innovative design facilitates proper decontamination. The CBRN Overboots are easy to put on or take off and are designed to integrate with a wide range of protective clothing. They're offered in five sizes from Small to XXLarge, and cover primary footwear sizes up to 18. The low volume vacuum packaging assures optimized storing space and easy stowing. Used by NATO, its allies, and First Responders worldwide, the CBRN Overboot is the most widely used and user proven CBRN protective footwear in the world. The heavy duty CBRN Gloves offer Chemical, Biological, Radiological and Nuclear (CBRN) protection. Built with proprietary rubber compounds that provide the longest protection in the industry, the CBRN Gloves meet the needs of firemen, armed forces personnel, first responders or anyone requiring protection from hazardous materials.